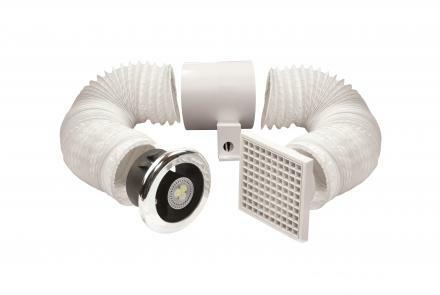 100mm Lo-Carbon axial in-line shower fan and light kit. Provides simultaneous fan and light operation. Suitable for shower enclosures and wet areas. Available with both a white and chrome bezel on light assembly. The light assembly can be held in place using fixing clips or screws. CE marked in accordance with all the relevant EEC Harmonised Directives. Fan double insulated and the motor is fitted with Thermal Protection. Light assembly class III. 12 volt DC 3W GU5.3 sealed lamp. Powered by an LED Driver. LED lamp lumens output 180lm – 200lm Input, AC. Output - 12 volt DC. 1A. CE marked in accordance with all the relevant EEC Harmonised Directives. Fan double insulated and the motor is fitted with Thermal Protection. Light assembly class III. 12 volt DC 3W GU5.3 sealed lamp. Powered by an LED Driver. LED lamp lumens output 180lm – 200lm. Input, AC. Output - 12 volt DC. 1A. 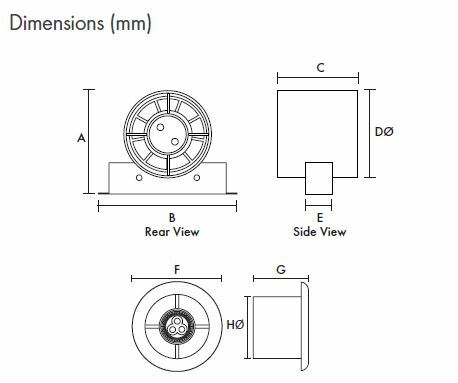 100mm axial in-line shower fan and light kit. Includes fan, 3m flexible ducting, white grille, LED lamp light transformer and light assembly with white and chrome bezels. 100mm axial in-line shower fan and light kit. Fan has electronic overrun timer adjustable from 5 to 30 minutes. The factory setting is 15 minutes. Includes fan, 3m flexible ducting, white grille, LED lamp light transformer and light assembly with white and chrome bezels.